oven around the dramatic chase across the world to bring down the most prolific and high-profile trafficker of temple idols is a tale of avaricious museums, apathetic governments, honest policemen, and avid bloggers. This book, based on the author’s painstaking research into the events and characters as well as his own efforts at tracking down stolen idols and collaborating with authorities across the world, reads like a Dan Brown thriller. That is a strong testament to Vijay Kumar’s skills in the way he is able to marshal an astonishing array of faces and facts and locations into a gripping, coherent narrative. If you had to guess, you may be excused if stolen idol trafficking did not strike you as among the most profitable and least risky businesses to be in. Lest you be skeptical, let us look at some figures, both anecdotal and substantial. 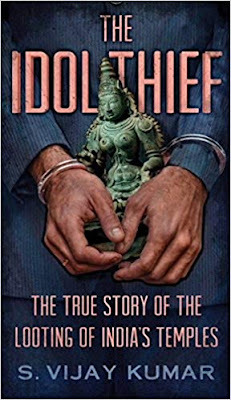 First, when the US authorities raided idol trafficker Subhash Kapoor's warehouses in 2012, they recovered stolen idols valued at over $100 million. After you catch your breath, consider two facts here. First, that this represented just the value of his stolen inventory in those warehouses at that point in time. Second, that Kapoor had been in business for over three decades. Munch over the figure of $100 million along with these two factoids, and let that sink in. Kapoor plied his trade for over three decades before being caught. He was extradited to India, where he awaits trial. Whether he will be convicted, and whether that conviction will amount to anything less than a farce remains to be seen. Now, coming to the specific. In 2006, spread over several thefts, Sanjeevi Asokan, an art dealer based out of Chennai and also a supplier of stolen idols to Sanjeev Kapoor, got local thieves to break into and steal the Chola-era bronze idols installed at the Brihadeeswarar Temple in the sleepy village of Sripuranthan (in the Ariyalur district of Tamil Nadu). Among the stolen idols was a four-foot tall Nataraja. The thieves were paid the princely sum of ₹5 lakhs, spread over two or three installments. What about Sanjeevi himself? He was paid more than one crore rupees! And what about Sanjeev Kapoor himself? Just the four-foot tall stolen Nataraja that he had received he was able to sell to the National Gallery of Australia for $5.1 million! Yes, you could argue that at least Sanjeev Kapoor and some of his accomplices were arrested. Whether or not they are convicted is best left to one's imagination and faith in the Indian judiciary. But these arrests are but a drop in the ocean. According to a Comptroller and Auditor General (CAG) report in 2013, only nineteen artefacts were recovered between 1970 and 2000 (that is a period of 30 years), and none from 2000 to 2012. In 2018, the HR&CEB (Hindu Religious and Charitable Endowments Board) stated that 1,204 sculptures had been stolen from 387 temples since 1992, and that 56 of the 1200 cases had been solved, and stolen idols recovered in 18. Do the maths and you will realize that idol theft is a crime no one cares about, is highly profitable, and one of the least risky of professions to be engaged in. The author weaves a fascinating tale of how idols are identified for theft through a network of informers and locals and through the use of books on Indian temples. These middlemen, like Sanjeevi, then employ local thieves to use any and all means to break locks on temple doors, crowbars to prise open idols, and then ship the idols overseas. One gets a glimpse into the intricate web that is weaved to create a false trail to throw most people off their tracks. How? The middleman gets a few replicas of the stolen idol created through a competent craftsman. Then a front company is created and registered as a handicrafts exporter. After that, the shipment, which contains the original stolen idol, is certified as "newly made handicrafts" by showing photographs of the newly created replicas. After that, the value of the shipment is under-declared - as low as $1500 for a shipment that contains an idol that will be sold for hundreds of thousands, if not millions, of dollars! What about museums? Surely, they would conduct due dilligence to ensure they do not end up buying stolen idols, on may wonder. To put it politely, and as the book shows, due dilligence is an activity conducted more in the breach than the observance. In a bizarre game of one-upmanship with other art galleries, no more than a pro-forma check is conducted to verify that the idol being purchased is not stolen. Once acquired, museums are loath to share any details about their checks and provenance of the idol. To cite just one such example, the Toledo Museum acquired a Ganesha stolen from the same Sripuranthan temple for $245,000. As part of its due dilligence, it furnished a letter from a Selina Mohamed, who claimed to have had the idol in her family's possession since 1971 when her mother had purchased it on a visit to India. There are two interesting aspects to this letter of provenance that Ms Mohamed furnished. First, Selina had written several such letters in the past to aid idol trafficker Subhash Kapoor. She had three warehouses in her name but which had been paid for by Subhash Kapoor. The Toledo Museum's due dilligence consisted of no more than taking at face value a self-declaration by a person with close financial ties to the person selling them the idol! Second, Selina's and many other such letters of provenance for stolen, or not, idols sold to museums across the world stated the date of acquisition of the said idol around or before 1970. Why? Because, "according to an Indian law passed in 1972, any antiquity older than 100 years cannot be taken out of the country. If such an antiquity is discovered to have been taken out of India after 1972, then, under the terms of a UN convention, the recipient country has to forfeit it without compensation." Therefore, 1972 became a convenient year for both museums and traffickers of stolen idols. In the almost non-existent fight against idol thieves, you have a lone crusader in the form of Selvaraj, Deputy Superintendent of Police with the Idol Wing. Working with a highly depleted and demoralized force, he nonetheless managed to track down and successfully hunt Sanjeevi Asokan, but not without some high drama, midnight chases, and tracking his quarry over fifty-three SIM cards and fifteen mobile IMEI numbers! Within this group, however, was an informant who sabotaged Selvaraj's efforts on more than one ocassion. Finally, you have the author himself, who took his passion for iconography, a blog started more than a decade ago to share his interests with other like-minded people, and an amazing grit and single-minded obsession with tracking down these idol thieves, to the point where it actually made a difference and resulted in the return of more than idol to its home in India. Thrillers come in many shapes and sizes, in many settings, but the most satisfying ones are the ones that are grounded in reality. This book is one such instance. It brings alive the saga in a manner no less satisfying than a taut thriller. One of the best books I have read in a long time. Note: this review is based on a review copy provided by Juggernaut (the publisher of the book). Note: this review was first published in MyNation on . © 2018, Abhinav Agarwal (अभिनव अग्रवाल). All rights reserved.